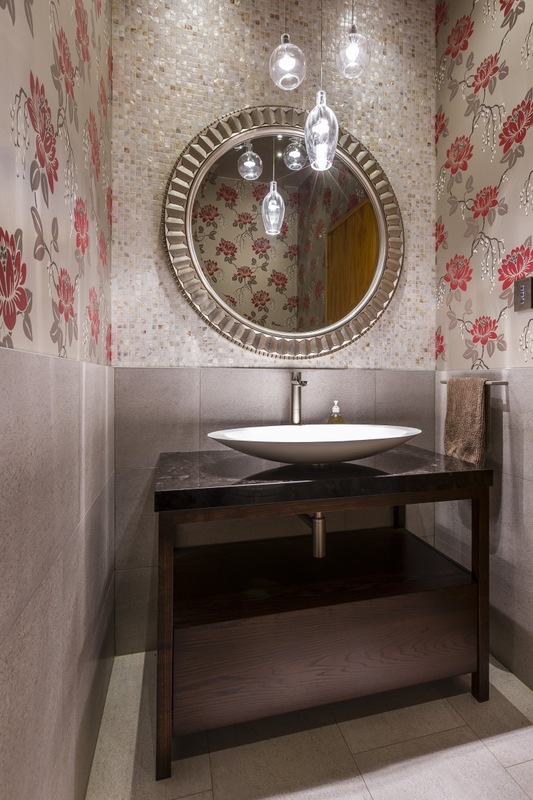 This powder room by designer Natalie Du Bois combines a refined, old-world sensibility with touches of modernity, such as the Cascade tapware, elliptical basin and crystal pendants. The smallest room in the house brings the opportunity for an individual design statement. However, materials and tones can also connect this intimate space to the wider interior. 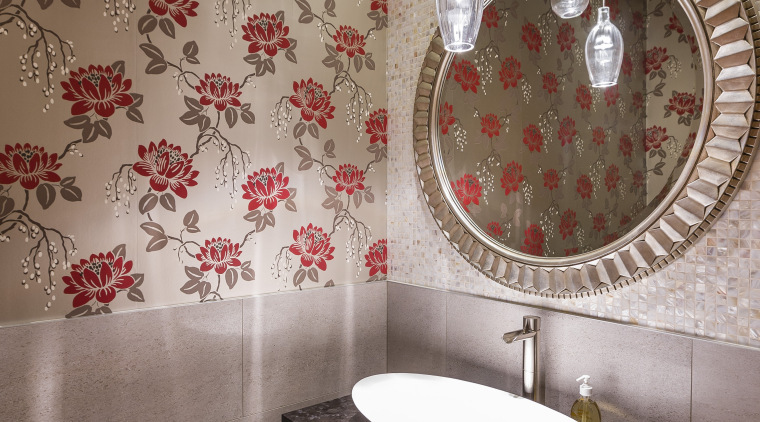 This reinvented powder room in a Tuscan-style home is by Natalie Du Bois. The designer says the owners had requested a glamorous feel. "To maximise light in the windowless room, I introduced reflective shell mosaics to the rear wall, and a retro-look gilded mirror from Italy. 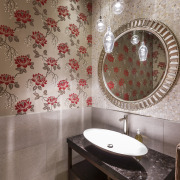 Shell mosaics and crystal elements in the brown granite vanity top sparkle in the light of the transparent sculptural pendants in this powder room designed by Natalie Du Bois. 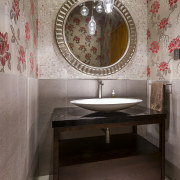 "The dark-stained oak wood vanity has a long brown granite top embedded with crystal elements. These catch the light in the same way as the mosaic tiles, creating a twinkling effect." Wallpaper is a feature of the home, and Du Bois chose a floral wallpaper for this space to bring in splashes of colour, further enlivening the decor. The red finds balance with the muted shades of champagne, brown and taupe. The room has an eclectic make-up. Classic elements are balanced by the modern crystal pendants, elliptical basin and Cascade tap. An emphasis on nature seen in the florals, stone-like porcelain wall tiles and shell mosaics quietly furthers the home's Tuscan sensibility, as does the tonal range.